In recent weeks, I’ve been obsessed with wondering how other Republican icons might react to this bunch of Bowery Boy dunces vying for votes. The medicine show breaks in a new grift. Follow the link for details. The name itself is cleverly designed to conceal the fact that your profile no longer arranges information chronologically. Yes, things are laid out by year and by month. But, when it comes to what’s displayed to your social circle at any given time, other metrics, including direct payments to Facebook itself, will now influence the ranking and placement of stories. This payola will be a crucial part of the graph rank, the new metric for placement that the social network uses to determine what appears on your profile. At SFGate dot com, the San Francisco Chronicle’s website, Leland Faust, a man who has gotten rich investing, considers what’s wrong with the Wall Street banksters. Using Jon Corzine’s ill-fated stewardship of MF Global as an example, he cites ten failings. 1. The cult of a Wall Street superstar. 2. Gambling disguised as investing. 4. Enormous conflicts of interest. 5. Leverage on a grand scale. 6. Failure of regulators and the reform law. 7. Misappropriation of client funds. 9. Golden parachutes soaring high. 10. Breakdown of morality: Even if something is legal, that doesn’t mean it is right. Follow the link to see the examples supporting each point. If you like World’s Dumbest, this is right up your alley. A news commentator in one of the snippets says that one of Mitt the Flip’s statements made him seem like Thurston Howell III. This insults Thurston Howell III. 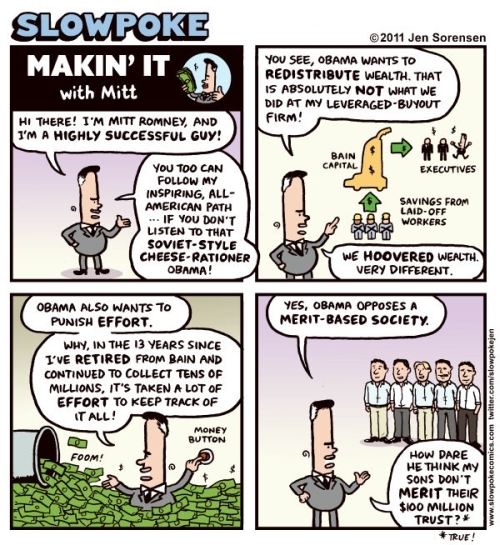 Mitt the Flip has neither his humanity nor his sense of humor. Always be polite to the help at the coffee shop. A teenage girl took her Christmas present to Starbucks with her and when she dropped her purse that gift fired a bullet. The 17-year-old had received the gift, a gun, from her dad for Christmas. He encouraged her to carry it so she’d be safe. The next morning, the girl, 16-year-old Allie Scott, found herself in big trouble. The Pinellas school district suspended her for three days. The Pinellas County Sheriff’s Office charged her with stalking. The girl’s parents have hired a lawyer and are threatening suit. “Stalking” does rather seem to be overkill. No word on the search for the anonymous car-keyer. Stock car twits spinning out on the curves. The aristocracy of feudal parchment has passed away with a mighty rushing, and now, by a natural course, we arrive at aristocracy of the money-bag. The Republican Party has become a deeply anti-democratic party. The (Virginia–ed.) state Republican Party will require voters to sign a loyalty oath in order to participate in the March 6 presidential primary. Anyone who wants to vote must sign a form at the polling place pledging to support the eventual Republican nominee for president. Anyone who refuses to sign will be barred from voting in the primary. I get mail about Republican attempts to keep out the vote. The nonpartisan Brennan Center for Justice has reported that as many as five million Americans have been disenfranchised by statutes such as HB 9 and SB 1. In a December 9, 2011 commentary in the Richmond Times-Dispatch entitled, “Voter ID laws recall Jim Crow”, Neil Pierce notes a 2006 study by the American Research Corporation that found that 25 percent of African Americans, 18 percent of senior citizens, and 18 percent of young adults (ages 18-24) do not possess photo IDs. Senate Bill 1 and HB 9 would make it much more difficult for young adults, low income people, senior citizens, and people of color to vote. SB 1 would eliminate voters from using their state issued voter registration card as an approved form of ID used to cast a vote. Both SB 1 and HB 9 would require voters to cast a provisional, not an official ballot if they did not bring an approved ID. Voters would have to later present the appropriate ID in order for their vote to count. Why are lawmakers making it harder to vote? To echo the writer’s question, why do Republicans fear the electorate? Learn more here. Sign the petition here. The failure of most Republican presidential wanna-bes to qualify for the Virginia Republican primary has been much in the news. Now some political bigwigs want to retroactively change the rules because, apparently, rules are for other persons. But that’s not where I was headed . . . . Buried in a long story about a retroactively-change-the-rules trial balloon is this tidbit. Even as some blame Virginia’s ballot requirements, CNN reported Wednesday that Gingrich told an Iowa voter that his Virginia petition-gathering effort was undermined by a worker who submitted 1,500 false signatures. But that would require applying a single standard, wouldn’t it? We can’t have that, now, can we? In Wingnut World, rules are for other persons (I guess that turned out to be where I was headed after all). The four-week moving average for claims, a less volatile measure than the weekly figures, dropped to 375,000 last week, the lowest level since June 2008, Labor Department figures showed today in Washington. Applications (INJCJC) rose for the first time in a month in the week ended Dec. 24, climbing by a more-than- forecast 15,000 to 381,000. The number of people continuing to receive jobless benefits rose by 34,000 in the week ended Dec. 17 to 3.6 million. Those figures do not include the number of Americans receiving extended benefits under federal programs. The number of workers who’ve used up their traditional benefits and are now collecting emergency and extended payments fell by about 7,800 to 3.5 million in the week ended Dec. 10. As usual, no attempt to quantify how many persons have fallen off the grid and no longer qualify for benefits of any sort. 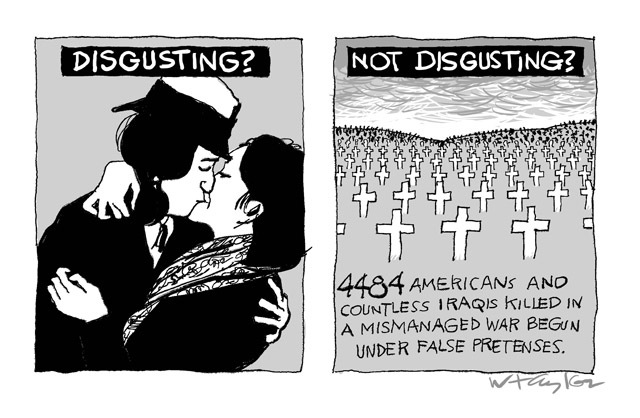 We well know about the horrible costs of the war: almost 4,500 American troops and tens of thousands of Iraqis killed and more than $1 trillion spent. But while we’ve heard a lot about the cost side of this equation, we’ve heard not so much about the benefit side. It’s as if there was no benefit. And a good way to calculate the benefits is to ask: What if President George W. Bush and Congress had decided in 2003 not to attack the tyrannical and murderous regime of Saddam Hussein? With the support of much of the American public. He proceeds to waste a couple hundred words trying to prove that sending persons to die for a lie is somehow a worthy exercise in the common weal. I suggest you read it. We are likely to hear more of this sort of revisionist drivel from the “war is always good” crowd over the coming years.